Cause of the Trojan war | Learn about Greek Mythology,Greek gods,Greek mythology stories! Zeus learned from either Themis or Prometheus , after his release from Hercules , that like his father Saturn , and he will be overthrown by a son. Another version says that a son of the sea goddess Thetis , whom Zeus fell in love , would become more important than his father. For one of these reasons Thetis married the elderly mortal King Peleus , son of Aeacus , or either by the instigation of Zeus or the desire of Hera . All the gods were invited to the wedding , and brought gifts except Eris , which by order of Zeus was not allowed to approach because she always caused divisions and upset . Eris affected , flew to the wedding venue a golden apple ( the Apple of Discord ) which wrote, to the prettiest . The apple claimed by Hera , Athena and Aphrodite . The conflict was very intense and no other god risked to express an opinion supporting any of the three, because it would provoke the wrath of the remaining two. Eventually, Zeus ordered Hermes to lead the goddesses to Paris, prince of Troy. The Paris then living as a shepherd on Mount Ida and being unaware of his royal origin, because he was abandoned from his family when he was an infant because an oracle said that he would cause the destruction of the city. The goddesses appeared to him naked and because he was not able to choose, they offered him gifts to chose: Athena will offer wisdom and skill in battle, Hera leadership and guiding the crowds, while Aphrodite offered the love of the most beautiful woman in the world, the beautiful Helen, queen of Sparta. So Paris gave the apple to Aphrodite. Later he returned to Troy, where he was acknowledged as a member of his family. Meanwhile Peleus and Thetis had a son and named him Achilles. According to a prophecy, Achilles would die as an old man and who lived a quiet life or would die young at the battlefield, but would gain immortality and his exploits would written through the centuries. When Achilles was nine years old, the seer Calchas predicted that Troy would not fall again without his help. Some sources state that Thetis tried to make him immortal while still an infant: every night put him over the fire to burn the mortal flesh and every day anoint him with ambrosia. But when Peleus discovered it prevented her out of fear for the liefe of Achilles. Another source says that Thetis bathed Achilles in the Styx, in the Underworld making him immortal in the places where the water of the river touched him.But, because she was holding him by the heels, that point remained vulnerable (Achilles heel). As he came of age he became one of the most skilled warriors. Due to the prophecy of Calchas, Thetis hid Achilles in Skyros at the palace of King Likomidis, dressed him female not to be recognized. The most beautiful woman in the world then was thought Helen , one of the daughters of Tyndareus , king of Sparta. Her mother Leda had enchantered by Zeus , transformed into a swan , which is why some sources refer to Zeus as her father. Helen because of her exceptional beauty had many suitors , but was unwilling to choose one with the fear that she would anger the other . Finally, a suitor, Odysseus of Ithaca, proposed a way to resolve the issue. Proposed that all suitors to defend Helen's marriage at all costs, regardless of whom you choose the same. The suitors finally swore to observe this condition as a condition for the possibility to be selected as spouses of Helen. non, who married the sister of Helen, Clytemnestra and recaptured the throne of Mycenae. And it's time to fulfill the promise of Aprodite. 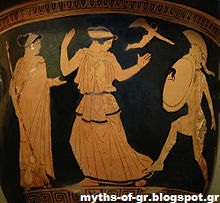 While Menelaus was at one version to Crete to bury his brother Krateo, Paris, the guest of Menelaus or in other fleet admiral against Greece, kidnapped with the help of Aphrodite Helen with her will (at other version with violence initially) and sailed to Troy having grabbed the treasures of Menelaus. Hera tried to prevent them causing storms, which led the love couple in Egypt. The myth of Helen is probably attributed to the poet Stesichorus, in the 6th century BC. The ship finally arrived toTroy, after passing through the Sidon of Phoenicia. 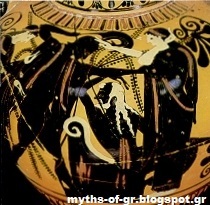 The abduction of Helen by Paris was not the only similar event in the world of Greek Mythology. Previously, Io was abducted from Mycenae, Europe from Phoenicia, Jason kidnapped Medea from Colchis, Troas Isione was kidnapped by Hercules, who had offered her to Telamon of Salamis. According to Herodotus, Paris did not expect some revenge by Menelaus, as neither the oldest abductions had caused severe reactions. According to mythology, Troy was besieged and conquered before, by Hercules, who immediately put on the throne the then young Priam.